Product prices and availability are accurate as of 2019-04-18 04:34:14 EDT and are subject to change. Any price and availability information displayed on http://www.amazon.com/ at the time of purchase will apply to the purchase of this product. This detailed antique replica pays homage to the originals unearthed in Stornoway Harbor, Scotland, now residing in the British Museum. The faux ivory board opens to hold captured pieces and boasts a beautiful Celtic knot playing field. 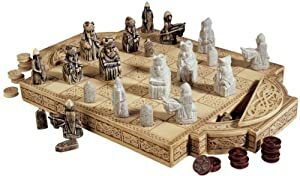 The epitome of historic art, our exclusive designer resin set also includes two-toned checkers with a Celtic motif.